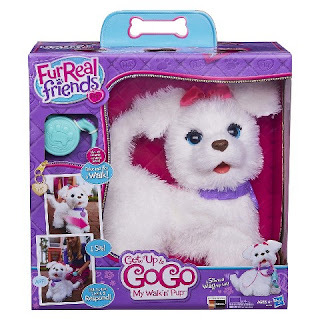 Head over and grab this FurReal Friends Get Up and Go Walking Pup Pet $24.99 (Retail $59.99). Cuddle and play with the FurReal Friends Get Up and GoGo My Walking Pup Pet. Talk to your toy dog and she will bark a response. She sits on command just like a real dog. And if you take her for a walk with her remote control leash she is more than happy to follow you anywhere. The FurReal dog features snuggly soft fur and adorable puppy sounds but never makes a mess or grows up. This is a wonderful motion activated toy for that child wishing for her very own pet. Suggested ages 4 and up. This is a great time to Sign up for Target REDcard and save 5% and receive Free Shipping on EVERY order always. Just in time for this event! Check out all of the Black Friday In July Target Deals HERE!